HIGH QUALITY SLIPPER SOCKS - women winter socks are made of Acrylic+ Cotton. Super thick fleece interior for maximum warmth and comfort .Non-skid bottoms to prevent slipping and sliding. Non Slip Cozy Winter Socks - Silicon rubber grips on soles of socks prevent slips and falls on smooth floors, such as hardwood and tie floors.More safe to walk around at home! UNIQUE DESIGN --The unique socks come in different colors and Cartoon Animal pattern to keep everything fresh and stylish! 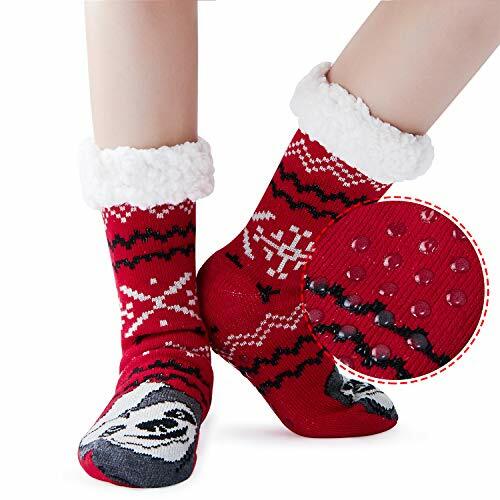 Great Gift -- The Christmas socks for festival and winter cute decoration,Would be a special great gift for friends, family, your girlfriend, wife in their birthday,Christmas and Holidays Gift! Cutest and Warmest Slipper Socks.